UNITED NATIONS, July 25 -- After the Eritrean delegation left the Security Council sanctions committee on July 22, rival Ethiopia made a request to similarly be held by the committee, Inner City Press has learned. By the five o'clock Monday deadline there had been no objections to Ethiopia being invited. Thus, int the coming days, the Meles Zenawi government will present its case, behind closed doors, presumably for continued and expanded sanctions on Eritrea. Eritrea's foreign minister and presidential adviser, having met with Secretary General Ban Ki-moon on Monday, will have already left town. They made the first argument to the committee, but not the last. Meles with Ban, previously, sanctioned party in the middle? Some would like the committee's proceedings opened up, but that would require the consent of all 15 members, which is unlikely. But we are following these sanctions. Watch this site. 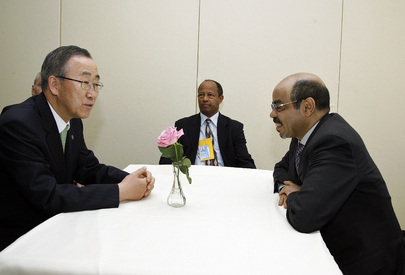 UNITED NATIONS, July 25 -- After Eritrea's foreign minister Osman Saleh Mohammed met Monday with UN Secretary General Ban Ki-moon, his Permanent Representative to the UN Araya Desta gave Inner City Press a read-out of the meeting. Ambassador Desta said that Somalia was discussed, with Eritrea explaining its view that in Somalia there can be no military solution and all sides have to be represented, with the solution coming from Somalis and not from the outside. Eritrea is accused of, but denies, providing arms to Al Shabaab. The United States is accused of using helicopter gunships and working with “black site” secret prisons in Mogadishu. Inner City Press, having last week interviewed Eritrean presidential adviser Yemane Ghebreab on video (click here to view), attended the delegation's photo op with Ban Ki-moon and his staff, noting there the presence of UN deputy humanitarian chief Catherine Bragg, who earlier on Monday briefed the Security Council about famine in Somalia. “Was famine in Eritrea discussed?” Inner City Press asked. Desta said no, that while the Horn of Africa is suffering droughts Eritrea “had a good harvest last year” and stored food, and according to Desta has bought food and stored it as well. Desta volunteered that there has been a dispute between Eritrea and UNICEF but that his delegation told Ban that the country wants to have good relations with the UN. An email to UNICEF spokespeople did not result in any substantive answer on this, but if one if provided later it will be published. Along with Ban's scheduler and his chief of staff Vijay Nambiar, Department of Political Affairs chief Lynn Pascoe attended the Eritrea meeting. On the way in he joked, “You complained no one else was present, so I came.” There were a lot of UN officials there, perhaps as a follow up to Eritrea's presidents request to Ban on July 8 for a longer meeting. But what was really accomplished? The UN Security Council's committee is slated to consider a monitoring report and more sanctions on Eritrea. One purpose of the trip seems to have been to try to fend these off -- with any success is not yet clear. Watch this site. UNITED NATIONS, July 22 -- After UN Security Council members met behind closed doors Friday afternoon about Somalia and Eritrea sanctions, Inner City Press asked committee chairman Hardeep Singh Puri of India if new sanctions on mining and funds from the Eritrean diaspora were discussed. “We need a meeting on that,” he said, adding that he had invited Permanent Representative Desta and presidential adviser Yemane Ghebreab -- who Inner City Press interviewed on July 22, click here for video -- to respond to the “outlines” of the forthcoming monitoring committee report. The discussion take place as the Somalia's Al Shabaab, which Eritrea is accused of supporting, vacillate about allowing humanitarian groups in to the drought ravaged areas under their control. Some said that holding the briefing might “raise expectations” that the UN could or would do something in the face of Al Shabaab's humanitarian blockade. But later Friday it was confirmed: the briefing will proceed. Eritrea's foreign minister Osman Saleh Mohammed is slated to meet with Secretary General Ban Ki-moon on July 25 at 3:30. And later in the week, sources say, the monitoring group's report should be made public. We'll see. UNITED NATIONS, July 21 -- After the Eritrea meeting of the UN Security Council on July 19, which Inner City Press was one of only two media outlets to go to cover, and of the two the only one to write about it, Eritrea's Mission to the UN reached out to offer an interview with Yemane Ghebreab, special political adviser to President Isaias Afwerki. But Yemane Ghebreab on July 21 told Inner City Press that Somalia was in fact discussed with Ban. Video here. As sources in the Security Council's closed door July 19 meeting said happened there, Yemane Ghebreab denied that Eritrea has supported the Al Shabaab rebels in Somalia. For this proposition, he argued that Eritrea is a secular country, half Christian, and would not support Islamists. Yemane Ghebreab said that in the close door meeting the US, represented by Ambassador Susan Rice, had urged further sanctions on Eritrea, including some that would bar the diaspora from sending money home for development projects, and block investment in mining, including by American firms. Yemane Ghebreab said that the US will support Ethiopia whatever it does, including “violating international law” by holding on to Eritrean territory including Badme, and buying 200 tanks while asking for aid money. Inner City Press asked if he thought that Ethiopia being tapped as provider of troops for Abyei in Sudan further isolated Eritrea. We do not begrudge them their peacekeeping role, Yemane Ghebreab in essence replied. Inner City Press asked Yemane Ghebreab about the recent defections by Eritrean athletes; he replied that was merely “migration." Inner City Press asked if military aged males are not allowed passports. There is “national service,” he said, like the draft the US had in the Vietnam War era. Inner City Press asked if the family of people who defect are punished. “Only if they are complicit,” Yemane Ghebreab said. He said his country became independent as the Cold War ended and things have not worked out in the Horn of Africa as they had hoped. He said there is hope. We'll see.